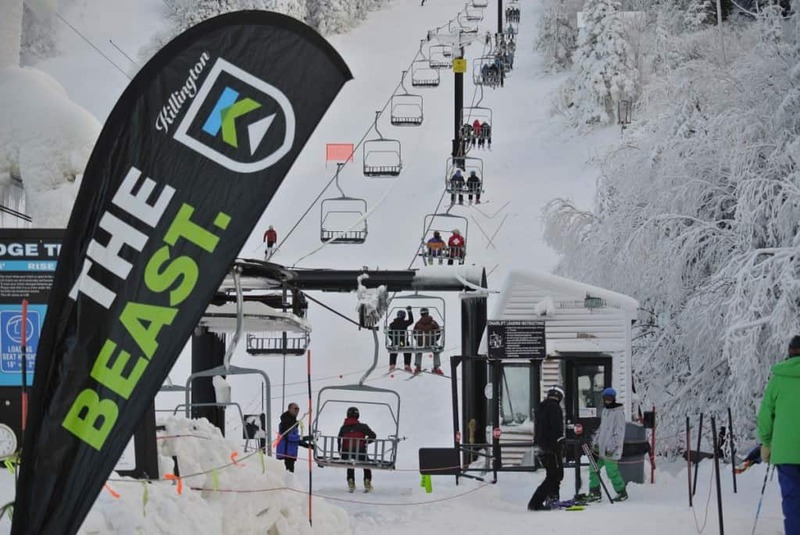 Home > Featured > Killington opens! KILLINGTON – “While you spent Halloween night getting dressed to kill and scarfing sweets, our snowmakers hit the hill like a ton of bricks (or 720,000 gallons of water),” the resort wrote in the “Drift” newsletter, Nov. 1. It didn’t take them long. Less than 48 hours later, Killington Resort opened for the 2014-15 winter season. The first day, Monday, Nov. 3, was dedicated to Season Pass and Express Card holders. Tuesday, Nov. 4, the slopes opened to the general public. Killington expects to remain open daily for the duration of the season making it, once again, the longest season in the East. Killington tied with Sunday River, which also opened Nov. 3, for the title of first open in the east. Killington has held this distinction for the past four years, consecutively opening Oct. 24, 2013, Oct. 13, 2012, and Oct. 29, 2011. “The strategy isn’t just about producing enough snow to open for a day, it is about producing a sustainable product that will hopefully begin and continue the ski operations for the new season,” rote Solimano in his Insider blog, Nov. 2, quoting Jeff Temple, director of mountain operations. Killington Resort’s mountain operations team has kept its focus on winter since the last chair spun in May, and has made significant improvements for the season with upgrades to snowmaking, lifts, signage and the trails, the resort stated in a recent release. Nearly 400 new low-energy snow guns join Killington’s fleet this year for an anticipated 10 percent reduction in regular energy usage while making more snow. “That includes over 80,000 gallons of diesel fuel — enough to fill up your car over 5,000 times,” Solimano explained. “For the season’s first round of production on Rime, every one of the trail’s 45 hydrants will host three different types of snowguns – ready for anything,” Solimano continued, explaining that every snowgun performs differently, and the Killington arsenal is built on versatility for all conditions. Okemo Mountain Resort also started blowing snow Nov. 1 and hopes to open within the next two weeks. Their official opening date is set for Nov. 15, conditions permitting. They are gunning to open with five trails, which would put them at the most open terrain in the east on their opening day. For more information visit www.killington.com or www.okemo.com.